Buffalo, New York (October 1st, 2018) – Howard Hanna Real Estate Services, the third largest real estate company in the United States, is hosting their annual Sales Managers Symposium in Buffalo, New York. The event will take place on October 2-4, 2018 at the Hyatt Regency Hotel and brings together managers as well as staff from each Howard Hanna market. 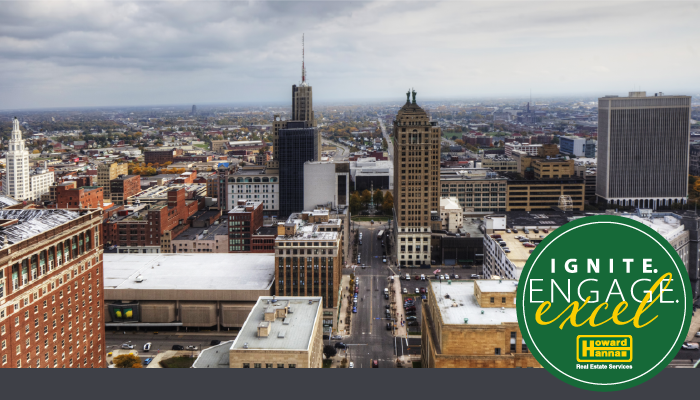 For three days, Buffalo will be flooded with green and gold as more than 250 participants from Pennsylvania, Ohio, New York, Virginia, Michigan, West Virginia, North Carolina, South Carolina and Maryland gather to “Ignite, Engage and Excel.” This Symposium comes on the heels of a new partnership with Allen Tate Real Estate, expanding the company footprint, as well as a substantial $5 million investment in technology advancements. York Baur, CEO of real estate technology firm Moxiworks, will unveil Engage CRM, a state-of-the-art customer-relationship management system that will be part of the Howard Hanna toolkit beginning this fall. Howard Hanna’s Executive Team, including Chairman Howard W. “Hoddy” Hanna, III, Chief Executive Officer Helen Hanna Casey, and President of Real Estate Brokerage Howard W. “Hoby” Hanna, IV, will each present during the general session on the “state of real estate,” as well as discussing the trends they foresee for 2019. This will be the first time that Howard Hanna has held its symposium in Buffalo, and the company looks forward to partnering with local businesses in Western New York.